No brain surgery this week, just the very simplest of all behaviour management techniques. Want to know what it is? Well, it involves a piece of paper and a pen and 10 minutes of your time. That’s it. So often, we can forget about this. The best practitioners have a natural ability to visualise how they want day-to-day classroom procedures to look. Here’s a simple example. Do you have children in your class/es asking you whether they can go to the toilet or perhaps fill up their water-bottle? I’m guessing you do. 1. We don’t let anyone go. Bit mean that one. 2. We let everyone go as many times as they jolly well want to. “Just been 10 minutes ago? Of course you can go again!” Some children may take advantage. 3. We let some students go sometimes. A popular choice this one. However the problem occurs when highly paid teaching practitioners become toilet arbiters. The toilet arbiter needs to consider all the variables: time of day, distance from last break, distance to next break, whether they’ve already been in that session, whether there is a medical reason, whether they go to the toilet most sessions of most days, whether they go and return quickly or unbelievably slowly etc etc. This is quite time-consuming and often you lose both ways. You begrudgingly let them go with the sneaking suspicion that they are just having a little break or you feel guilty because you don’t let them go and you fear they may explode. You’ll have some already, no doubt. However, can you add to them and can you visualise an easier way to navigate them? 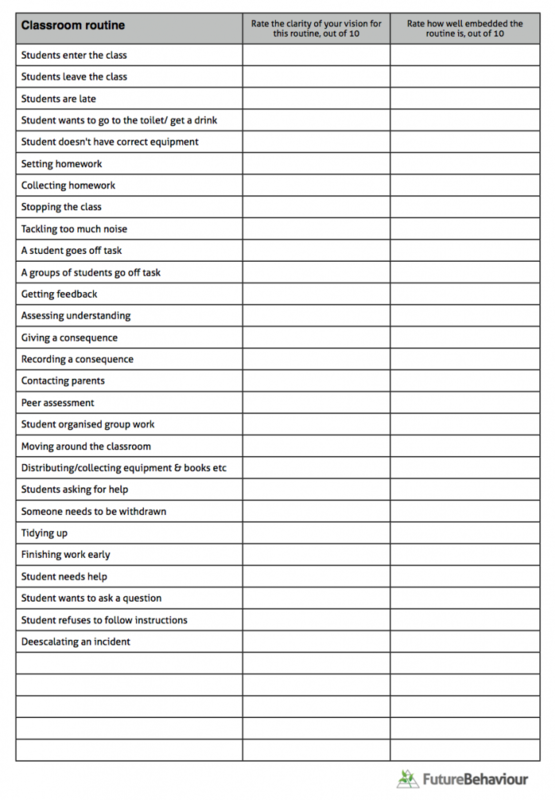 Below is a downloadable checklist with lots of classroom routines. Take 10 minutes to reflect on them. Reflecting on your own practice is one of the simplest behaviour management techniques there is. It’s also very handy when someone comes in to your classroom to reflect on your practice for you. You’ll have done it already. 1. Download the Classroom Routine Reflection Checklist. 2. Fill in the numbers. 3. Choose some routines to focus on – you’ll find this easier now that you’ve reflected. 4. The best way to focus on them is to complete the FREE 50 Minute Behaviour Course.